This is a photo taken at the Dutchman's Curve crash site in 1918 with a large crowd gathered at the scene. Click to see a slideshow. The next photos are from the Interstate Commerce Commission's investigation into the crash. This is a general view. Some of the cars were piled up after derailing. This is a boiler from one of the trains. This is the other bioler. This view is from after two cars had been drawn apart. This was the view train 1 had before colliding head-on at Dutchman's Curve. I'd like to know more about the wreck at Dutchman's Curve. How did it happen and what changes resulted from it? One train that left around midnight was coming into town from Memphis, carrying mostly African-Americans headed to work at DuPont's new gun powder plant in Old Hickory. The train leaving Nashville was headed west to Memphis. And both were late. The front page of the Nashville, Tennessean on July 10, 1918. The death totals were revised in the following days. There were more injuries than the first count. The Nashville train should have waited for the Memphis train to reach the double tracks that start around Centennial Park. But the engineer leaving Nashville, also late, barreled ahead. More: Read the Interstate Commerce Commission's incident report. The locomotives collided at a big bend in the tracks near Belle Meade, behind what is now a Publix. Because of the curve, they didn't see each other until it was too late. "People from miles away heard the crash and just came running," Nashville historian David Ewing says. As many as 40,000 people came to see the carnage, he says. The site was so gruesome that steel-stomached butchers were called in to help with the bloody cleanup. "This was a very sad story, just because of the loss of human life," Ewing says. "But out of the 101 people that died, over 90 of the people were African-American." There's a reason so many African-Americans died: They were traveling in unsafe Civil War-era cars made of wood, unlike white passengers, who rode in steel Pullman cars. The wooden cars, on the other hand, splintered and caught fire. The Metro Historical Commission put up this marker in 2008. "The African-Americans that were on this train did not have a chance to survive, given where they were," Ewing says. 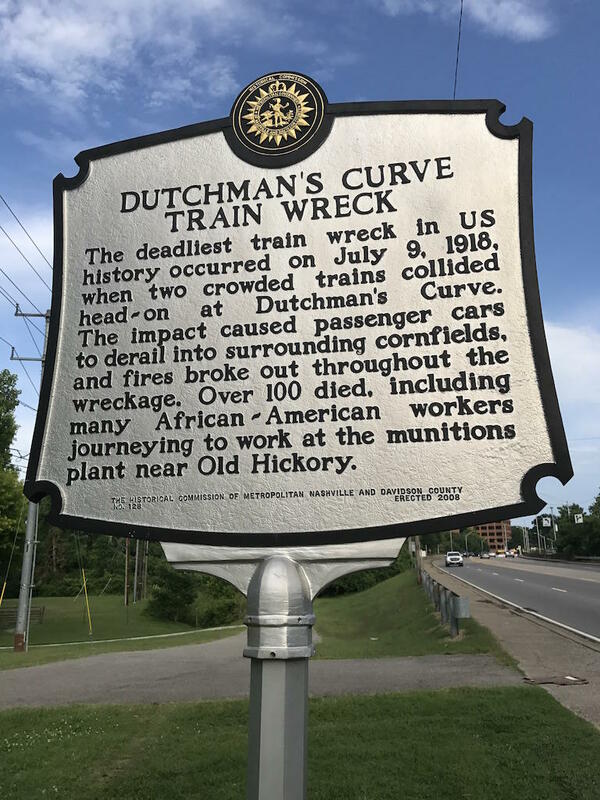 Racial discrimination may help explain why Dutchman's Curve didn't really become well known Nashville lore. But it was also lost in the bigger news of the day. About a hundred Americans were dying in World War I every day at this point. 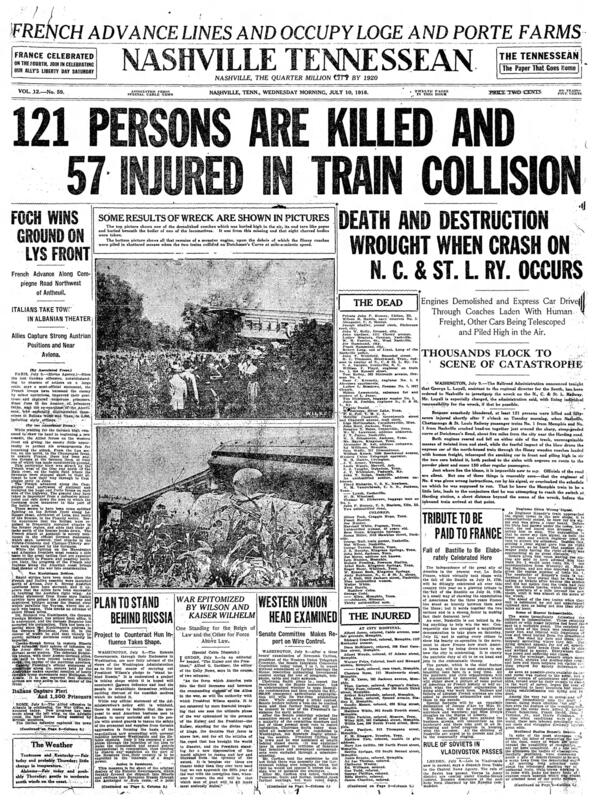 The names of casualties replaced the wreck on the front page of the paper by the end of the week. Ewing helped place a marker near the crash site for the 90th anniversary, and he's beginning to plan a centennial commemoration to make sure people know the country's deadliest train wreck happened in their backyard. WPLN listener Hart Armstrong asked the following question to Curious Nashville: Where in Nashville did the artist William Edmondson live? Is there a plaque? The short answer is that the home of sculptor William Edmondson—the first African American to have a solo show in the Museum of Modern Art—is no longer standing. And in fact, his whole block was torn down years after his death, during an urban renewal project in Edgehill that began in the late 1960s. The Metro Council is scheduled to vote Tuesday night in support of changing the name of Fred Douglas Park. The problem is, the parks board isn't technically allowed to change the names of parks.